It's a measure of how severe the tree die-off in California has been in recent years that when the state announced Monday it lost another 18 million trees in 2018, a top forestry official pronounced the result "encouraging." That's because California lost far more trees in the three prior years, including a jaw-dropping 62 million dead trees in 2016, due to a combination of drought and bark beetle infestation. "It is encouraging that the rate of mortality slowed in 2018. However, 18 million trees are an indication that the forests of California are still under significant stress," said Thom Porter, director of the California Department of Forestry and Fire Protection. "The stress of drought, insects, disease and prolific wildfire will continue to challenge the resilience of the state's forests." Scott Stephens, a fire science professor at the University of California, Berkeley, said the accumulation of dead trees, mostly pines and firs in the Sierra Nevada mountains, is "huge," adding: "As the trees begin to fall down in 10 years or less this still changes the fuel profile and potential for mass fires." Trees dry out as they die, which makes them even more flammable. 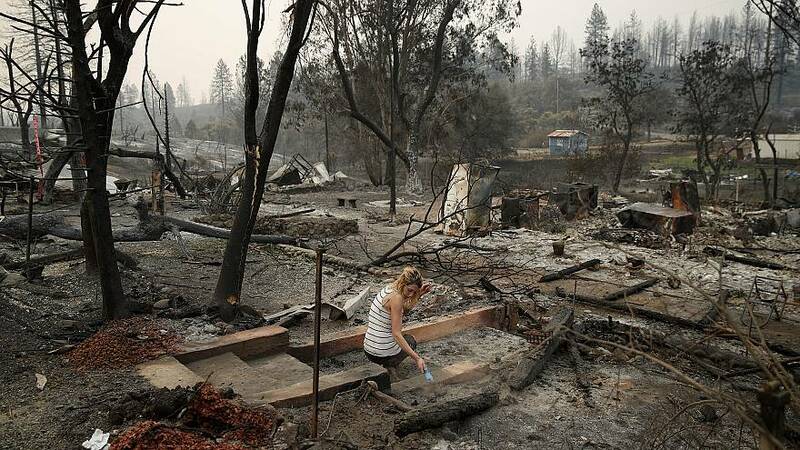 Worry about the amount of fuel provided by dead and dying trees has been heightened because of a string of deadly wildfires including 2016's Thomas Fire in Ventura and Santa Barbara counties; the 2017 blazes that blackened much of the wine country in Napa and Sonoma counties, killing 44; and last November's Camp Fire, which killed 86 people and destroyed nearly 14,000 homes, both records for wildfires in the Golden State. Officials at the California Department of Forestry said that it typically takes at least three years of substantial rain and snow for trees stressed by drought to return to good health. That would mean the state's forests could benefit from at least one more year of wet weather to recover from the brutally dry period of 2010 to 2016. While the drought ended in 2017 after the wettest winter in decades, the United States Drought Monitor at the University of Nebraska still shows broad swaths of California in an "abnormally dry" condition. Trees depend on the moisture to maintain the sap that enables their immune system. "With the moisture diminished, so is the sap and that stresses the trees," said Scott McLean, a spokesman for the California Department of Forestry. "That left a lot of these compromised and the bark beetle was able to bore right in." Between 2010 and 2014, California forests lost an average of 2.2 million trees annually. The cumulative impact of little rain and the voracious beetle began to take its toll in 2015 — the state lost 29 million trees that year and then 62 million trees in 2016, an "unprecedented" number in modern times, said UC Berkeley's Stephens. Another 27 million trees were lost in 2017, before last year's 18.6 million total, state and federal forest officials said. State and U.S. forest officials have pledged to step up their "treatment" of forest land; that is the controlled burning and thinning that makes forests less susceptible to burning out of control. Together, the state and federal foresters would like to treat 1 million acres annually, 500,000 acres each. That would be a substantial increase from the 313,000 acres the U.S. Forest Service completed in 2018 and the estimated 30,000 acres California has averaged in recent years. Some sections of the Sierra Nevada have lost more than 90% of their trees. Such masses of fuel create the potential for "dangerous mass fires beyond the predictive capacity of current fire models," said a 2018 paper co-authored by Stephens. "These fires can generate their own wind and weather conditions . . . making fire behaviobehaviours impact on structures and public safety difficult to manage and predict."